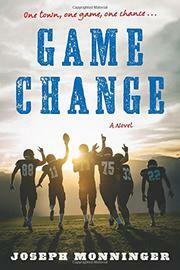 A coming-of-age story about a teen who gets the first—and only—start of his football career when their star quarterback is badly injured a week before a championship game. Zeb, an exceptionally well-mannered small-town high school senior who lives in a cramped camper, is thrust into the spotlight and a leadership role when the quarterback that Zeb’s backed up all through school, phenom T.T. (one of the only black kids in the primarily white school), is injured a week before the New Hampshire state championship game. An eccentric white teacher who carries a coup stick, both challenging and reinforcing myriad Native stereotypes, challenges Zeb to think about why football’s such a big deal, likening performance in the game to counting coup. The adults in Zeb’s life—his hardworking single mother, his gruff-but-good uncle, his enigmatic-yet-fallible football coach—are complex characters that he sees through new eyes as he figures out the kind of person he will be, on and off the field. Lyrical turns of phrase are balanced by Zeb’s frames of reference, and testicular-related, profane masculine posturing is balanced by heartfelt speeches from the coach. The plot has no direct villains, the slow-boil tension building anticipation with potential obstacles to Zeb’s playing, working its way up to the big game, which plays the themes out beautifully.